On the occasion of Canada’s 150th anniversary, we acknowledge the enduring presence of our Indigenous communities and recognize the fact that Canada has become home to many communities seeking refuge and opportunities. 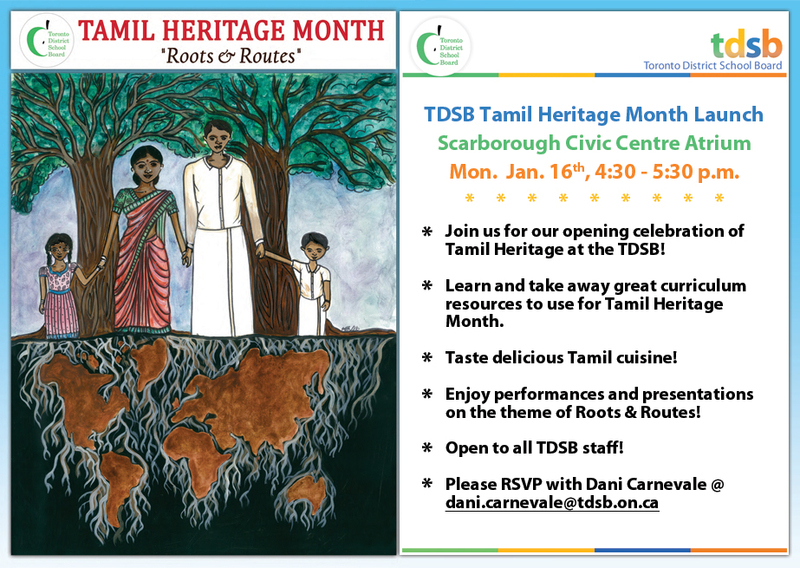 The theme for Tamil Heritage Month this year is Roots & Routes. To explore this theme, we are asking the following question: How have your cultural roots, as well as your family’s route(s) to Canada, shaped and continue to shape your identity as a Tamil Canadian today? Through essays, original artwork and public speaking contests, students across the TDSB will be exploring, reflecting on and creatively expressing their answers to this question during Tamil Heritage Month. Learn more about this year's contests. Tamil Heritage Month was nationally recognized in October 2016, when the House of Commons voted unanimously to recognize every January as Tamil Heritage Month. January was chosen as it coincides with one of the most important celebrations for Canadians of Tamil heritage, the Thai Pongal harvest festival. For farmers in India and Sri Lanka, January is a time of harvest. Thai Pongal is a celebration that offers thanks to the sun and cattle for a good season and abundant harvest. Many of the 75 million people who are part of Tamil community around the world, mark Thai Pongal irrespective of their religion. In 2014, the Government of Ontario, with full consent, passed legislation proclaiming January as Tamil Heritage Month. TDSB proudly marked Tamil Heritage Month for the first time in 2016.